HEARTLESS housebreakers smashed their way into an East Linton social enterprise before cleaning it out of up to £20,000 worth of high-tech equipment. Devastated staff at Viarama have had to put their work with children, the elderly and terminally ill on hold after the sickening raid in the early hours of Saturday morning. The callous thieves even stole a collection tin for a hospice, but the founder of the world first centre vowed to bounce back. “They smashed their way through a side window, clambered through and basically took everything,” said Viarama chief executive, Billy Agnew, 44. 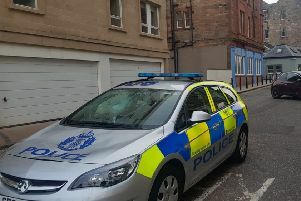 Staff turned up on Saturday to find thieves had taken all of their headsets and computers, which enable users to have experiences through virtual reality. No descriptions are available of those responsible but police are investigating. “We don’t have CCTV unfortunately. We don’t receive any funding so money is tight,” said Mr Agnew. Mr Agnew and his staff had already had to pull the plug on visits to Granton Primary School and St Columba’s Hospice this week. And worse still, thieves stole a collection tin for the Leuchie House respite centre for patients with long-term illnesses and their families in North Berwick. Now the firm are hoping supporters can get them back up and running as soon as possible to continue their work. “The community have rallied round which is great,” said Mr Agnew. “They’re in the process of organising a crowdfunder. Founded in 2015 as the world’s first VR social enterprise, Viarama employs two full-time staff with part-time placements for young workers. Their work harnesses the innovative power of technology to improve the quality of life of schoolchildren, senior citizens and others. Mr Agnew is now “exploring all avenues” including any philanthropic donations in a bid to get back on track. A police spokeswoman said: “A break-in occurred between 7pm on February 8 and 11am on February 9. Anyone with information can contact officers on 101 quoting reference 1729 of February 9 or Crimestoppers anonymously on 0800 555 111.